Remove the 2 start path cards from the deck ( blue or green ladder and a hat) and then shuffle the path cards and action cards together. Each player gets 1 role card (or miniature) and 6 cards from the deck. Shuffle the 18 gold cards, take 6 of them and lay them down like the picture to the right. The green dwarf plays first. A. Play a path card and draw 1 card. B. Play an action card and draw 1 card. C. Discard 2 cards and remove an action card in front of you and then draw 1 card. D. Discard 1 or 2 cards and draw as many cards as you have discarded. After you have drawn new cards, it's your opponents turn. When there are no cards left in the deck, the round ends. 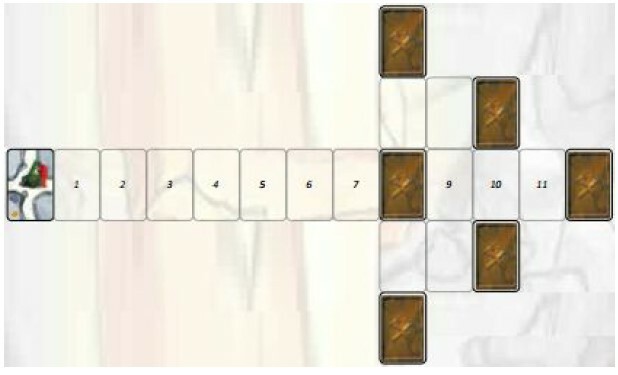 Path cards form routes to the gold cards. A player must play a card next to another path card already on the table. All the sides must fit with the existing tunnel(s). You may not lay a card horizontally. Both players try to get from their starting card to the gold cards. It can happen that both routes merge into one. From then on, both players can use each other's route. When placing a new path card, a continuous route must exist from YOUR start card to the new card. When you encounter a gold card on your route and you have a path leading to it, you flip the gold card over. You must try to make it fit with the cards around it and form a path to the last played path card. If that's not possible, you still need to place it in such a way that it makes a path with, at least, the latest last path card. The path on this card is in direct connection with your start card. Your path continues here! The card can be placed next to any path card, except: gold cards, start cards or cards with gold on it. The path behind the door can only be used by the dwarf of that color. The path for the other player ends here. The troll blocks the path behind it. If a player wants to continue on his path he must pay the troll 1 gold. To do this, you place one of the dwarf markers (your color up) on the troll. From now on, the troll won't block both players anymore. Gold nuggets on these path cards can be collected. When you create an continuous path from your start card to a gold card, you put a dwarf marker (with your color side up) on the card. At the end of the round, the dwarf gets the amount of gold shown on the card, no matter if the path still exists. When you create a path from your opponent's start card (with no path from yours) to a card with gold, he places a d warf marker ( with his color side up) on the card. A player places a sabotage card in front of another player. 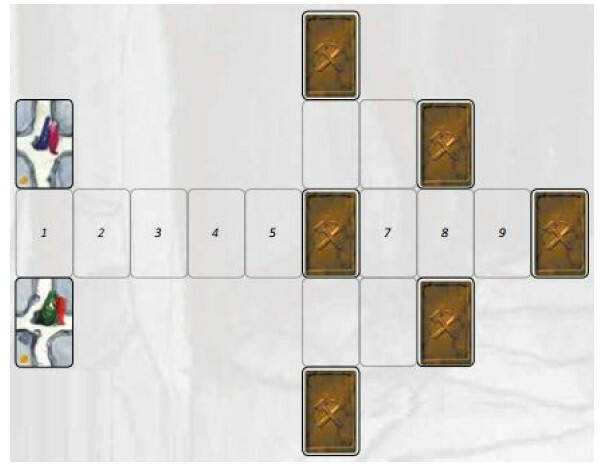 A player cannot have 2 of the same sabotage cards in front of him at the same time (he can, however, have another sabotage card of a different type). As long as a player is sabotaged, he cannot play a path card. With a repair card, a player can repair his sabotaged pickaxe, lamp, or cart. When using a repair card, the player may discard a sabotage card with a matching icon. You discard both cards. A repair card with 2 icons can only be used on a single sabotage card, and not two. A key card can be used on path cards with a door of the opposing color. You discard the card and place a key marker o n the path card allowing you to continue past the door as if it weren't there. It can happen that a player now creates a path from his start card to a card with gold. If so, you may now immediately place a dwarf marker on that card. A collapse card allows you to remove a path card in play. You discard both the collapse card and the p ath card. It is not allowed to be used on a start , gold , or path card with gold or a troll. A map card allows you to look at one gold card. Once you have looked at the gold card of your choice, you must place it face down in the exact same spot it was in before. You may not show the card to the other player. Discard 2 cards and remove a sabotage card in front of you. Draw 1 card (not 2). Discard 1 or 2 cards and draw as many cards as you have discarded. You must discard at least 1 card. All 6 gold cards are visible. All 8 dwarf markers have been placed in the tunnel. The deck is empty and both players have no cards left in their hands. Both players take the cards with gold on them that have their colored dwarf markers on it and keep them in front of them. These cards won't be shuffled into the deck in the next round. Players must now pay 1 gold for every troll with a dwarf marker of their color on it. You don't get change, so when you only have a card with 2 gold and must pay 1 gold, you pay 2 gold. If a player doesn't have enough gold, he pays everything he has. Place the other revealed gold cards in the box. Shuffle the unrevealed gold cards with the other gold cards. New round: Follow the preparation instructions. All dwarf and key markers are available again. The player with the least gold begins. If there's a tie, the blue dwarf begins. The game ends after the 3rd round. The player with the most gold wins. The player chooses 1 color. You only get 6 dwarf markers, but still get 2 keys. The number of spaces between the start card and the goal card is 7 cards. The player discards 10 cards after shuffling the deck. These cards are added again in the next round. When you draw a sabotage card, you must immediately play it on yourself. You then draw a new card. If you draw a sabotage card that is already in front of you, you discard it without any other effect. 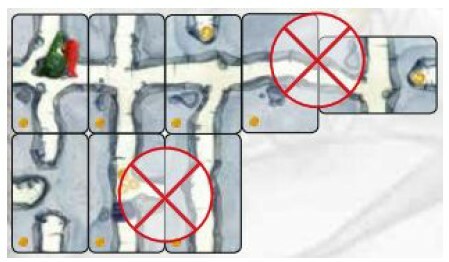 If you draw a collapse card, you must remove the last played path card (the card must not have gold or a troll on it). 0-14 points: You can't win every time. 15-19 points: Not bad, but could be better. 20-24 points: You have a nose for gold! 25+ points: Perfect! Master of the cave.